The holiday season is over and it's time to detox your body from all the food and drinks of the festival. 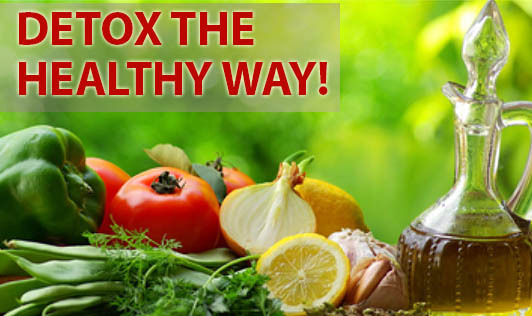 Detox, short for detoxification, is your body's natural way of eliminating toxins from the body. You don't have to starve yourself or workout for long hours in the gym to detox. Just follow these simple, sensible steps that can get you back on your feet, cure hangovers and help you lose those extra pounds gained during the celebration. 1. Drink up! : Water is a vital nutrient and helps to cleanse your system. Make sure you drink at least 10-12 glasses of water every day. Many people forget to do this. 2. Workout: Moderate aerobic exercises for 30 minutes every day will go a long way in reducing the extra pounds gained. The exercise can be cycling, walking, running, jogging etc. You can get creative and try dancing, Zumba, sports etc. Yoga can also be incorporated into the exercise routine. This will help eliminate toxins and calm your mind. 3. Watch the foods you eat: After the rich, fatty and sugary holiday feast, it's important to watch your diet. Make a conscious effort to include good nutrition into your daily meal plan. Try adding new, healthier foods to your diet like different fruits and vegetables. Here are a few foods that you can include and some that you may have to avoid eating. Foods to eat: fruits, dry fruits, vegetables like broccoli, cauliflower, cabbage, garlic, beets and green leafy vegetables, grains and starches like brown rice, buckwheat, oats, beans and legumes, nuts and seeds, oils like almond oil and avocado oil in limited quantities and water. Foods to avoid: Dairy products like cheese, yoghurt, butter, sour cream, cottage cheese, wheat and other gluten containing foods, sweeteners, corn, soy, caffeine, carbonated beverages, animal products like beef, pork, mutton etc, fatty foods, processed and preserved foods. Hallelujah diet: This diet is based on the idea that human beings are herbivorous mammals and that the body is not designed to digest and dispose off meat. This diet consists of 85% raw, uncooked and unprocessed plant-based food like raw fruits and vegetables, soups, muesli and beans and 15% cooked plant-based food like pasta, brown rice, cooked fruits and vegetables, beans and lentils. Mediterranean diet: Med diet is a lifestyle rather than a diet which includes food, exercise, meals with friends and family and wine in moderation. It is filled with flavor-full, delicious meals. The med diet includes plenty of vegetables, meat in small amounts, seafood and pure vegetarian meals at least twice a week. Fats and oils used are extra virgin olive oil, avocados, peanuts and sunflower seeds. Small amounts of yoghurt and cheese are also included in the diet. Finally, fresh fruit is replaced as dessert. Fat flush diet: This diet is claimed to help boost metabolism, reduce fluid retention and support weight loss, and is aimed at flushing out toxins from the body. It is done in 3 phases. The first phase has a restricted calorie intake for 2 weeks and does not allow alcohol, sugar, dairy, margarine, most fats and oils, bread, cereals, grains and starchy vegetables. The second phase is less restricted with a few more options to choose from, and the third, is the maintenance stage where gluten-free grains and dairy products are included. Keep in mind that these diets are not scientifically proven but are followed all over the world for different reasons. These diets are not recommended for pregnant and lactating women, children and people with severe diabetes, liver and kidney disorders.